This month Pula Imvula met with new Grain SA Vice-chairperson, Derek Mathews who is a grain farmer near Sannieshof. He has been involved in organised agriculture since 1984, first serving on the board of NAMPO (National Maize Producers Organisation) and when the grain organisations merged, he was one of the founding board members of Grain SA as we know it today. Mathews’s long association with organised agriculture has convinced him that farmers need to be involved in organised agriculture and have structures such as Grain SA in place to lobby on behalf of farmers who don’t always have the time to monitor the economic environment, policy and regulatory frameworks and legislation which directly affect their business environment. I asked Derek to identify his 2017 Grain SA Congress highlights. He said the keynote address by Mike Mlengana, DG: DAFF was inspirational. His message was founded on his Christian faith, his personal experience of a farming partnership which has seen a deep friendship grow between two human beings, and his personal passion for agriculture. Mathews said it was encouraging to hear what Mike’s vision is, since it is his leadership within DAFF that informs the political role-players and guides department activities and attitudes. It is very important to have leadership that has an understanding of the sector and is realistic about the road ahead. Mlengana was unapologetic about the fundamental driver for the agricultural sector: ‘From a policy perspective we must understand that we are correcting the difference that was created before.’ Land transformation must happen, but it has been impeded by a lack of commercial strategy in the sector. Previous strategies were too narrow and cost huge amounts of money, to very little effect. He despaired over projects like CASP and ILIMA where at least 9 billion was spent but cannot be accounted for. Mlengana dismissed past efforts saying there was little to no lasting impact on the lives and enterprises of the beneficiaries. He acknowledged this happened because people were appointed to posts on the basis of political alignment rather than skill, which resulted in “devastating chaos”. He is convinced it is organisations like Grain SA and farmers themselves who will make transformation work, if they can unify develop a common vision, common values and common goals. Unity amongst farmers, who all face the same problems, will make the difference when they speak about challenges faced by the sector. He also said it is only when the sector maps its own road ahead and owns the successes the failures that transformation will progress successfully. The danger about a lack of unity is it creates opportunity for apartheid to be blamed for failed land reformand also it allows incorrect perceptions about farmers to prevail. Mlengana also recognised the contributions made by farmers to villages, schools and in their communities, but said these need to be highlighted more to show government that farmers are partnering in transformation. Derek also feels we have many good stories to tell and Grain SA’s Farmer Development Programme can contribute in this regard by showcasing the great development work and many warm relationships built over the years. Mlengana said he believes that we can form significant partnerships to strengthen the agricultural sector and facilitate transformation and he encouraged farmers and their organisations to work together to create structures that allow for partnerships. He said future recapitalisation programmes will depend on partnerships between commercial farmers and black farmers. Mlengana is determined that continued focus on recapitalisation will see a shift to enterprise productivity and he will only consider ‘bankable business plans’. There will be a strict selection process for land beneficiaries: Farms will not be given or sold randomly and ‘non-farmers’ will be eliminated. He is looking for men and women born with a passion for farming. Mlengana also said he intends to see increased expertise within relevant departments and greater accessibility, ‘My office is open to you, bring ideas!’ No strategies should be developed at local level without the involvement of agricultural sector stakeholders. Mathews also took note of Mike’s message to farmers not to be alarmed by the land ownership issues which form a central theme in political rhetoric and encouraged them to trust the constitution. Other important issues discussed at Congress focussed on the economic environment and future grain production potential. Prof Ferdi Meyer is with the Bureau for Food and Agri-cultural Policy (BFAP) which focusses on benchmarks and monitors trends and ‘mega-factors’ which affect the market and trade environment. He believes consistent and focussed research and development is essential, together with a politically stable environment. Some issues which influence the sector are: The declining rural population and rising urbanisation creates two different value chains. The need for job creation in the sector – three main opportunities for job creation have been identified: 350 0000 potential jobs could be found in under-utilised or unproductive land reform projects; 200 000 jobs could emerge in the intensive commodities sector like irrigated, high value crops if markets exist; and 326 000 jobs could be created within the agro-processing sector. Meyer also noted that in the long term real agricultural prices are declining for all commercial farmers around the world. Production cost comparisons highlight the fact that South African producers are paying approximately /ton more for inputs, e.g. higher fertiliser prices, which instantly puts local producers on the back foot when competing with international markets. Although we have a free market, it is not always fair, so this is where calls for intervention become necessary. Soybean production has become a game changer and good opportunity exists for soybean production in the next few years. Mathews says his vision for his term as Vice-chairperson of Grain SA is to get a new generation more involved in organised agriculture to build an organisation that is relevant and modern and able to serve all grain farmers, no matter how big or small and regardless of historical issues. He recognises that transformation is a priority now but he believes with time we will move into a new era which will still need Grain SA keeping its finger on the pulse to be a watchdog and to inform, protect and monitor the agricultural environment in the best interests of ALL grain farmers. In an effort to participate in the transformation process, the congress also voted on changes to the constitution which directly impacts New Era farmers and creates more scope for involvement of members from the Farmer Development Programme as leaders in the organisation and representatives on the board. 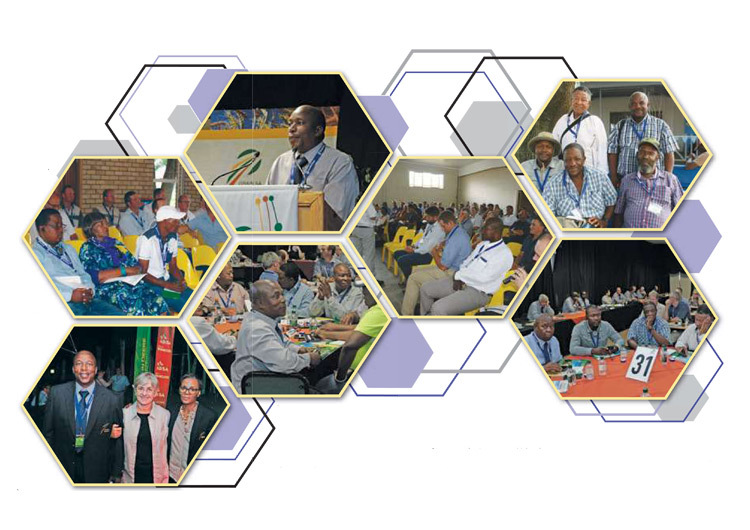 The role of Grain SA Congress will always be to hear from leaders like Mlengana and learn from experts like Meyer who have valued insights, but also to create a platform where farmers from all walks of life can meet to discuss burning issues and ultimately find the common vision, common values and common goals that Mike Mlengana is calling for. The annual Grain SA Congress was held at NAMPO Park on 8 - 9 March 2017.